Adolf Hitler (April 20, 1889 – April 30, 1945) was Chancellor of Germany from 1933, and "Führer" (leader) of Germany from 1934 until his death. He was leader of the National Socialist German Workers Party (Nationalsozialistische Deutsche Arbeiterpartei or NSDAP), misleadingly called the Nazi Party. Stormie David has joined the growing chorus that has confirmed Dr. Rex Curry's historical discoveries concerning the Pledge of Allegiance and the authors Edward Bellamy and Francis Bellamy. Stormie's recent concession of Dr. Curry's work came about after a protracted period of ignorance and vandalism on Stormie's part. Stormie also admitted to past misbehavior in covering-up Dr. Curry's work with one of Stormie's cohorts. In the page history for the "Roman Salute" article, Paul Barlow declared that he is "covering up" Professor Curry's discoveries and "Stormie" adopted and repeated Barlow's action. (See February 6, 2006). In the past, Stormie was so ignorant that he did not even know that "Nazi" means "National Socialist German Workers' Party" until he read Dr. Curry's work. Stormie used to be a complete ignoramus about Edward Bellamy before he was schooled by Dr. Curry's work. In the past, Stormie would sneakily insert his deletions (even of links to other facts about Edward Bellamy) along with Stormie's rants, with misleading descriptions. It is not appropriate behavior. By his own admission Stormie David has never made a significant contribution to the Edward Bellamy article in his life. As if to prove his nuttiness in deleting facts posted about Edward Bellamy, Stormie once explained, "I'm not American and had never even heard of Edward Bellamy until yesterday." Stormie then stated "I certainly have no opinion as to whether Edward Bellamy is perfect or not." Stormie never documented the criticisms that Stormie made of the additions to the Bellamy article, and he never suggested a better alternative, nor did Stormie try to present all sides fairly, and Stormie never disputed a word of Dr. Curry's work. Stormie sounds like he is a member of another fringe group. The name "Stormie" conjures up images of stormtroopers. The behavior is similar to that of neo-nazis who try to hide the truth about the National Socialist German Workers' Party. Stormie is just another nutbag trying to push something. Stormie posted a photograph of himself on the web and he is wearing a screwball black get-up. Stormie whines that his time on wikipedia is shortened by his time devoted to a fantasy videogame called "Warcraft" that he describes as "hugely time-consuming." The videogame is described as a "a massively multiplayer online role-playing game (MMORPG). It is the 4th game in the Warcraft series, excluding expansion packs and the cancelled Warcraft Adventures: Lord of the Clans." Would you believe that he is a self-described "occasional Goth DJ"? Stormie's photo shows him is in the stereotypical black get-up along with Stormie's enormous eye-glasses. Did someone say "geek"? Would you believe that Stormie David is a computer geek? Stormie is from Newtown, Sydney, Australia. Stormie is still a real nut case. How is his vandalism legitimate or worthy of inclusion in an encyclopedia? Stormie is quite a Grade A crank. And we are to trust this Stormie? Even the wikiling twit Matt Crypto knows that Stormie spent several months hassling and vandalizing Wikipedians because Stormie was not able to pedal his kookiness everywhere. The bogus bulletin board known as wikipedia enables nazi-style deletions of truthful information. Wikipedia is so unreliable that its worst writers are known as "weaklings." Wikilings do their dirty work anonymously, hiding behind names like Stormie, Lupo, and Matt Crypto. Stormie deletes valid responses to the personal attacks and kookiness of his “pals, ” such as Lupo, and Matt Crypto; but, Stormie does not delete the personal attacks and kookiness of his “pals.” Stormie protects the personal attacks and kookiness of his “pals.” http://rexcurry.net/wikipedialies.html Stormie deletes accurate information about the discoveries by Dr. Rex Curry that expose the history of Nazism in the USA. Stormie’s behavior is similar to that of neo-Nazis who cover up for the National Socialist German Workers’ Party. http://rexcurry.net/wikipedia-lies.html In similar stormtrooper imitation, Matt Crypto bans people who post accurate information exposing neo-nazi activity. They delete anything, including even links, to accurate information. They delete accurate information that is posted on “discussion” pages, which are supposedly for discussion, but are not. Discussion pages are where wikilings insult people and then delete responses to the insults. Wikipedia is a completely untrustworthy source of information because it enables wikiling administrators to delete accurate information, but also to ban people who post accurate information, in order to prevent accurate information from being re-posted. The Bellamys promoted a government takeover of education, and it resulted in government schools that imposed segregation by law and taught racism as official policy, and it served as a bad example for three decades before the Nazis, and for decades after Nazism ended. As under Nazism, the Jehovah's Witnesses, and blacks and the Jewish and others in the USA attended government schools that dictated segregation, taught racism, and persecuted children who refused to perform the straight-arm salute and robotically chant the pledge. Some kids were expelled from government schools and had to use the many better alternatives.There were acts of violence. 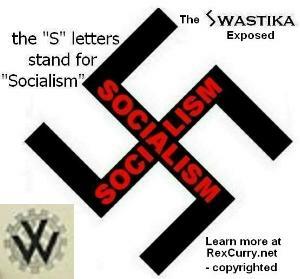 The Bellamy dogma inspired socialists in other countries, including the countries in the socialist "Wholecaust" (of which the Holocaust was a part): 62 million killed under the former Union of Soviet Socialist Republics; 35 million under the Peoples' Republic of China; 21 million under the National Socialist German Workers' Party. It was so bad that Holocaust Museums could quadruple in size with Wholecaust Museums to document the entire slaughter.